I have been making custom aircraft models, as a hobby,for the last 10+ years and during this time I have created around 86 models in 35 different airline liveries, 15 different airframes, and in 3 scales in 3 scales(5 in 1/500, 61 in 1/400 and 19 in 1/200). Many of my first productions where made for forum members. 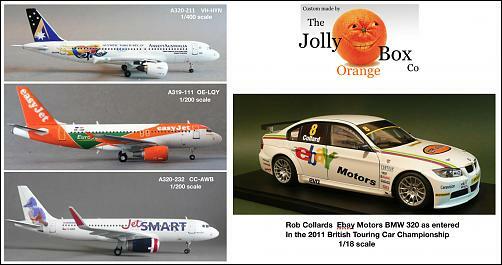 My main focus has been on EasyJet which has resulted in 26 different examples in all 3 scales. Of the 86 I have 3 particular favourites which reached my level of near complete satisfaction in terms of accuracy and finish. I would also add a 1/18 scale racing touring car which provided me with new challenge. I have created all the decals required to complete these models with one exception when I purchased a DrawDecal sheet to complete my first 1/200 scale EasyJet in the latest colour scheme. Eventually I managed to work out how to replicate that scheme on my steam powered computer. My Achilles heal when it comes to decals is that my cheap and cheerful inkjet printer is unable to print anything that is white. Not to sure how many more I will make as time has taken its toll on my eyesight, i now need to wear 2 pairs of glasses at the same time to do the fine detail. Last edited by modelmanGB; 04-14-2019 at 04:23 AM. Awesome work! Being from the south pacific, I am partial to local liveries and that Ansett Australia a320 looks beautiful. Your work is exceptional. Anyone out there that has one of your models, will hold on to those gems as they more than likely mean something special to them. At least you know your work wont get traded around and sold off. So much joy to be had from them. Hi There, your easyjet models are so good. is the orange areas decals or paint? if so how do you mask off for such a clean finish? can you do one for me if i provide the white decals and the model? I suggest you take a look at my thread (link below) which shows how my decals are done. Some orange paintwork is required to fill in the blanks and the engines. I suggest you send me PM with your request. Ansett's B747-312 Sydney 2000 01, VH-INJ is Here!